The Scientists Are Very Busy! In the past day, it has become extremely busy onboard as scientists are now receiving many samples. The labs humming away. We have completed hole U1365B and early this morning the ship was moved 20 meters to the north to begin hole U1365C. As you can see in the photo, some of the scientists are working in a cold room (4 degrees C) within the chemistry lab. 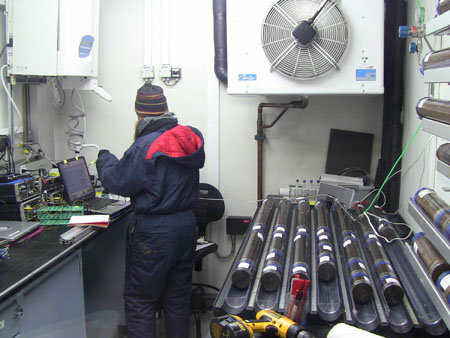 They are interested in the amount of oxygen in the cores and have discovered oxygen in some extremely deep sediments. They believe that there will be oxygen in even deeper cores still to come. Out in the warmer confines of the chemistry lab, others are squeezing core samples to collect water that is stored in the pore spaces between the sediments. The chemicals in the water will tell the researchers about microbes and changes in the geology. They put samples in metal containers and then place the samples in a press; water is collected in a syringe as the squeezing process continues (see photos below). Up on the core deck, scientists are placing flags in the cores to indicate where they intend to take a sample. Each scientist has their own brightly colored flag. We also held our first ship to shore video conference yesterday with students at Saint James Academy in San Diego! It was a big success. The class was able to take a visual tour of the ship while sitting in their classroom on shore and we happened to be on the cork deck when a core was brought in from the catwalk! Students also got to ask questions of the scientists who were working in the labs at the time. For the class, it was like actually being on the JOIDES Resolution.